Stellar Townhome Residence Steps from EVERYTHING! NEW & IMPROVED! This spacious & quiet, luxury 3 level condo in the historic 'Pick and Gad' Building in Telluride. Central location in town is one or two blocks from ski lift, gondola, town park, river, trails, library and the bars and restaurants of Telluride's main street. FLEXIBLE RENTAL RATES. PLEASE E-MAIL US WITH YOUR TRIP DETAILS! WILL NEED TO CONTACT US DIRECTLY FOR HOLIDAY/FESTIVAL RATES. TOO MUCH TO INCLUDE ON THE LISTING. Recent remodel has made this amazing townhome a total of 5 BR (2 bedrooms with king sized beds, 2 bedrooms with queen beds, + a 3rd bedroom with a twin bed plus trundle underneath. Downstairs entry/mudroom with off-street parking. Also a big living room with expansive couch for overflow sleeper or inflate-bed. NY loft style high ceilings with 2,200+ sq feet of living space. Designer furnished and lighting with outdoor deck and a gated yard. Living room has 42' flat screen HDTV. Deck and dining rooms adjoin new kitchen with restored vintage stove. The top floor master suite features 270-degree views with private deck. The two existing bedrooms offer views of the ski mountain and the Telluride library, and then another master suite is on the ground level which could be locked-off separately. The condo features a private downstairs entrance, tree-filled backyard, a fully outfitted kitchen with modern appliances, tiled bathrooms, and a reserved parking space. The main living area is on two levels with kitchen, breakfast bar, dining room, living room, and French doors that open onto a deck for BBQ and mountain views. Contact us if you have any more questions and we hope you have a great visit! We live locally and manage this property for our friend and neighbor. 220 South Pine is one of the oldest and best restored buildings in Telluride. We support the Town of Telluride's modern efforts to make itself more environmentally sustainable and own a portion of a solar array in nearby Paradox Valley to help power the condo. Centrally located to everything, very comfortable and well furnished. TV with Direct TV Satellite, Stereo (speakers wired throughout the house), Fully outfitted Kitchen with Microwave, Refrigerator with Ice Maker, Cooking Utensils, Linens (high thread-count 100% cotton), Full-sized Washer/ Dryer, Maid & Private Concierge service available, Non smoking. We had three families and it was perfect for all of us! Great beds!! The loft is big, comfortable, and really close to the Gondola and tons of food options. size pan and small pan and frying pan. Had to keep washing out the pans to cook. Kitchen not supplied at all. No crock pot. The house was very comfortable other than the kitchen. Fantastic! Totally hip, clean, spacious accommodation in the center of downtown Telluride. Three floors of architectural detail. Five bedrooms spread out over three floors, four full baths (including two steam showers). 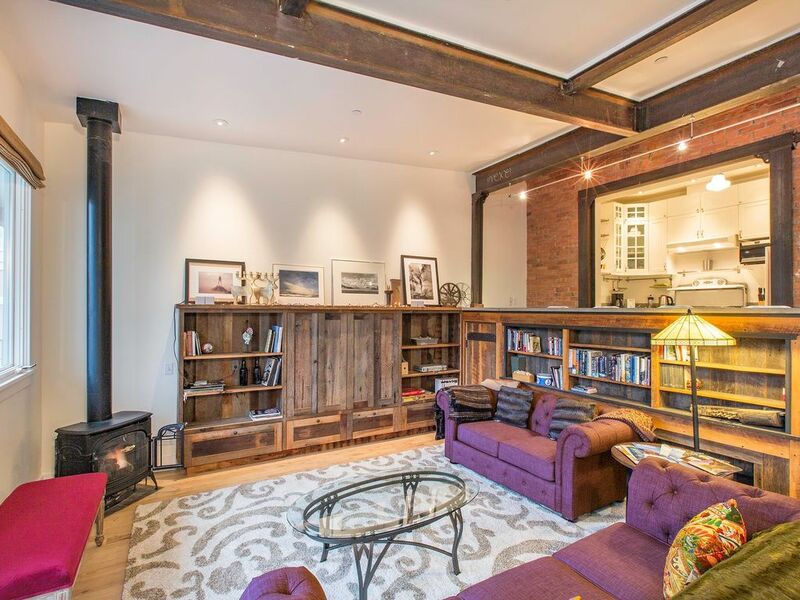 High ceilings, exposed brick, tons of charm and light. You will not be disappointed. Perfect for large family. Centrally located, one block from the gondola , and one block from downtown shops and dining. This is our second visit and we plan on returning! Bright, clean, spacious... just perfect. Amazing unit in the heart of Telluride. The location couldn't be any better. One block to the Gondola (takes you to Mountain Village) and one block to the main street in town where the best restaurants and shops are situated. Hiking trails a block away, too. The house itself is clean, bright, and beautifully remodeled. I wish I lived there! The owners are great, and were very accommodating. I can't wait to return. Spent 10 days here in August and can't recommend this place (and its great owner J.J.) enough. Once everyone arrived, we walked downstairs and across the street to Smugglers for some great beers and a meal. After, we kicked back on the condo deck and watched the moon come up over the mountains. Really enjoyed being such a short walk to everything Telluride has to offer (2 blocks to main street, 2 blocks to the gondola/farmers market, 1/2 block to the river!). Mostly just really appreciated having a quiet place where you can enjoy kicking back on the deck with a view of a wonderful aspen tree shaded backyard and mountains, while still being in the heart of the amazing mountain town. You will not be disappointed if you choose this place! Can't wait to go back! Telluride sits in a box canyon. Steep forested mountains and cliffs surround it, with Bridal Veil Falls at the head of the canyon. Numerous weathered ruins of old mining operations dot the hillsides. A free gondola connects the town with its companion town, Mountain Village, Colorado, at the base of the ski area. Telluride and the surrounding area have featured prominently in pop culture. It is the subject of several popular songs. It is especially known for its ski resort and slopes during the winter as well as an extensive festival schedule during the summer. Telluride is located at an elevation of 8,750 feet in an isolated spot in Southwest Colorado. From the west, Colorado Route 145 is the most common way into Telluride; however, there are two alternate passes to enter the town: Imogene Pass and Black Bear Pass. On the eastern side of town, there are two waterfalls, Ingram Falls, which is visible from town, and Bridal Veil Falls and the Bridal Veil Hydroelectric plant, which are just out of sight from town to the right of Ingram. The power plant house was leased for a period of time by Eric Jacobsen, who restored the house and the generator inside. The hydroelectric plant was built in 1895 to power the Smuggler-Union Mine. It is the second-oldest alternating current power plant in the world, the first being the Ames Hydroelectric Generating Plant near Ophir, Colorado, also in San Miguel County. The town is served by air transportation via Telluride Regional Airport (TEX), the highest altitude commercial airport in the United States. The airport is considered challenging by pilots because of frequent adverse weather conditions, high altitude, and the extremely rugged mountain terrain which surrounds the airport on nearly all sides. Major airline service is provided seasonally into Montrose (MTJ), approximately 70 miles north by road. The town of Telluride is the county seat and most populous town of San Miguel County in the southwestern portion of the U.S. state of Colorado. The town is a former silver mining camp on the San Miguel River in the western San Juan Mountains. The first gold mining claim was made in the mountains above Telluride in 1875 and early settlement of what is now Telluride followed. The town itself was founded in 1878 as 'Columbia,' but due to confusion with a California town of the same name, was renamed Telluride in 1887, for the gold telluride minerals found in other parts of Colorado. These telluride minerals were never located near Telluride, causing the town to be named for a mineral which never was mined there. However, the area's mines for some years provided zinc, lead, copper, silver, and other gold ores. As of the census of 2000, there were 2,221 people, 1,013 households, and 357 families residing in the town. The population density was 3,143.3 people per square mile (1,207.8/km²). There were 1,938 housing units at an average density of 2,742.8 per square mile (1,053.9/km²). The racial makeup of the town was 92.57% White, 0.81% Native American, 0.72% Asian, 0.41% African American, 4.14% from other races, and 1.35% from two or more races. Hispanic or Latino of any race were 7.20% of the population. There were 1,013 households out of which 19.1% had children under the age of 18 living with them, 25.2% were married couples living together, 6.1% had a female householder with no husband present, and 64.7% were non-families. 31.9% of all households were made up of individuals and 1.6% had someone living alone who was 65 years of age or older. The average household size was 2.19 and the average family size was 2.79. In the town the population was spread out with 14.3% under the age of 18, 12.2% from 18 to 24, 50.9% from 25 to 44, 20.8% from 45 to 64, and 1.9% who were 65 years of age or older. The median age was 31 years. For every 100 females there were 122.8 males. For every 100 females age 18 and over, there were 127.4 males.